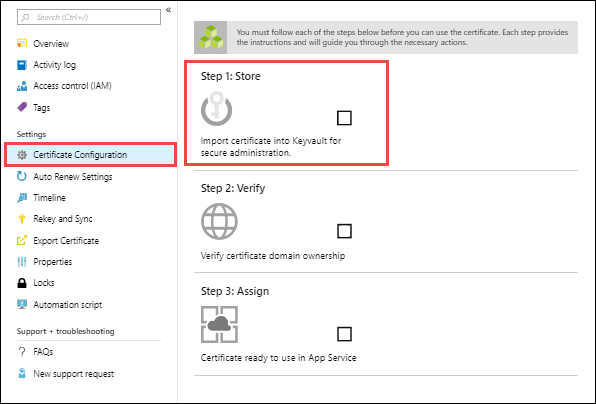 This tutorial shows you how to secure your App Service app or function app by creating (purchasing) an App Service certificate in Azure Key Vault and then bind it to an App Service app. 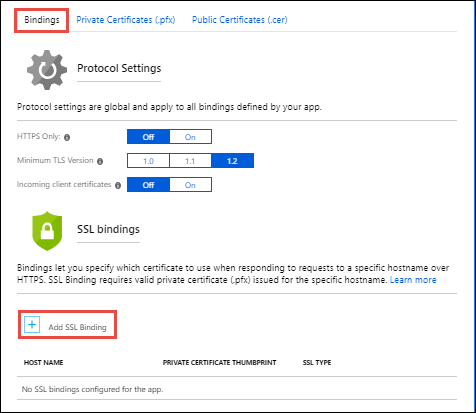 App Service Certificates can be used for any Azure or non-Azure Services and is not limited to App Services. To do so, you need to create a local PFX copy of an App Service certificate that you can use it anywhere you want. For more information, see Creating a local PFX copy of an App Service Certificate. To bind a custom SSL certificate (a third-party certificate or App Service certificate) to your web app, your App Service plan must be in the Basic, Standard, Premium, or Isolated tier. In this step, you make sure that your web app is in the supported pricing tier. From the left menu, click App Services, and then click the name of your web app. You have landed in the management page of your web app. In the left-hand navigation of your web app page, scroll to the Settings section and select Scale up (App Service plan). Check to make sure that your web app is not in the F1 or D1 tier. Your web app's current tier is highlighted by a dark blue box. Custom SSL is not supported in the F1 or D1 tier. If you need to scale up, follow the steps in the next section. Otherwise, close the Scale up page and skip the Scale up your App Service plan section. Select any of the non-free tiers (B1, B2, B3, or any tier in the Production category). For additional options, click See additional options. When you see the following notification, the scale operation is complete. 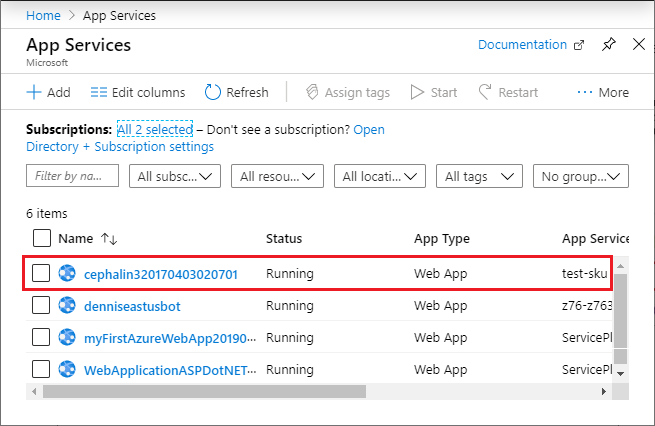 Start an App Service certificate order in the App Service Certificate create page. 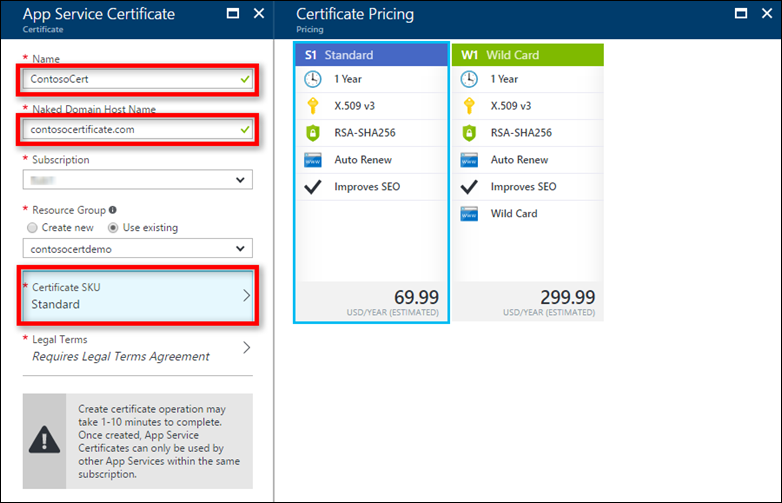 Use the following table to help you configure the certificate. When finished, click Create. Name A friendly name for your App Service certificate. Naked Domain Host Name If you specify the root domain here, you get a certificate that secures both the root domain and the www subdomain. To secure any subdomain only, specify the fully qualified domain name of the subdomain here (for example, mysubdomain.contoso.com). Subscription The datacenter where the web app is hosted. Resource group The resource group that contains the certificate. You can use a new resource group or select the same resource group as your App Service app, for example. Certificate SKU Determines the type of certificate to create, whether a standard certificate or a wildcard certificate. Legal Terms Click to confirm that you agree with the legal terms. The certificates are obtained from GoDaddy. Once the certificate purchase process is complete, there are few more steps you need to complete before you can start using this certificate. 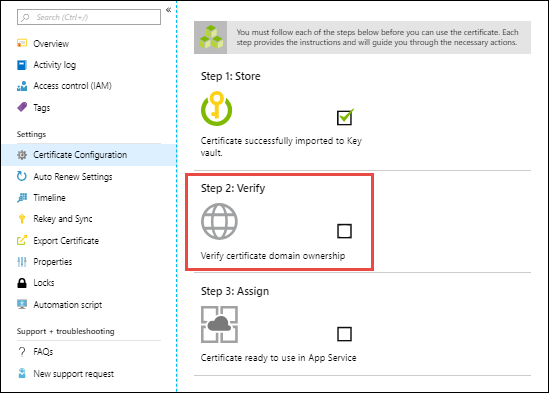 Select the certificate in the App Service Certificates page, then click Certificate Configuration > Step 1: Store. Key Vault is an Azure service that helps safeguard cryptographic keys and secrets used by cloud applications and services. It's the storage of choice for App Service certificates. In the Key Vault Status page, click Key Vault Repository to create a new vault or choose an existing vault. If you choose to create a new vault, use the following table to help you configure the vault and click Create. see to create new Key Vault inside same subscription and resource group. Name A unique name that consists for alphanumeric characters and dashes. Resource group As a recommendation, select the same resource group as your App Service certificate. Location Select the same location as your App Service app. 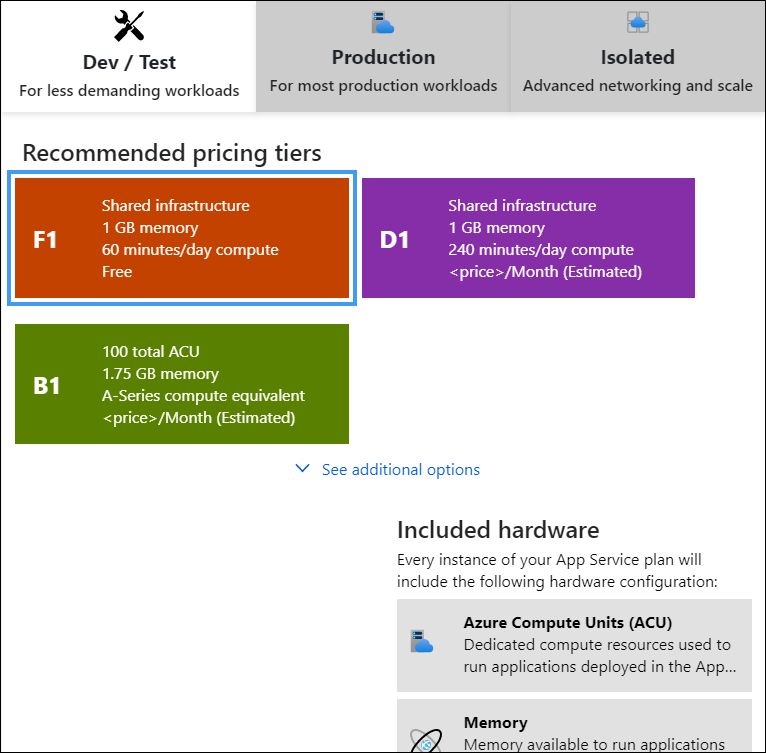 Pricing tier For information, see Azure Key Vault pricing details. Access policies Defines the applications and the allowed access to the vault resources. You can configure it later, following the steps at Grant several applications access to a key vault. Once you've selected the vault, close the Key Vault Repository page. The Store option should show a green check mark for success. Keep the page open for the next step. From the same Certificate Configuration page you used in the last step, click Step 2: Verify. Select App Service Verification. Since you already mapped the domain to your web app (see Prerequisites), it's already verified. Just click Verify to finish this step. Click the Refresh button until the message Certificate is Domain Verified appears. App Service - The most convenient option when the domain is already mapped to an App Service app in the same subscription. It takes advantage of the fact that the App Service app has already verified the domain ownership. 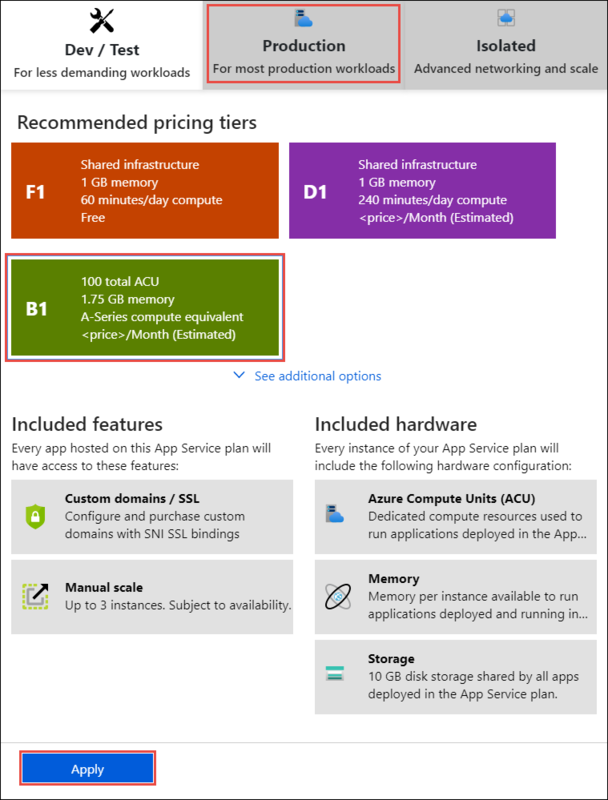 Domain - Verify an App Service domain that you purchased from Azure. Azure automatically adds the verification TXT record for you and completes the process. Mail - Verify the domain by sending an email to the domain administrator. Instructions are provided when you select the option. Manual - Verify the domain using either an HTML page (Standard certificate only) or a DNS TXT record. Instructions are provided when you select the option. 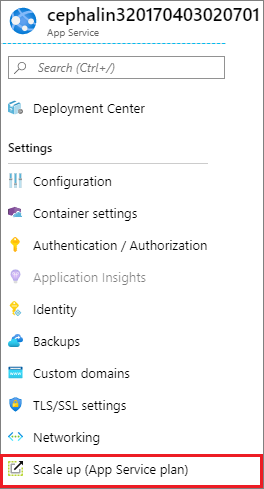 In the Azure portal, from the left menu, select App Services > <your_ app>. 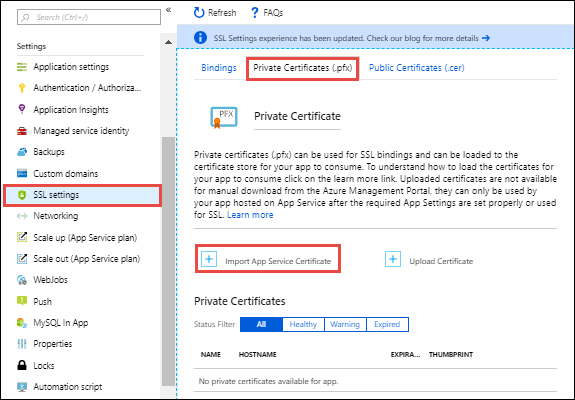 From the left navigation of your app, select SSL settings > Private Certificates (.pfx) > Import App Service Certificate. Select the certificate that you just purchased. Now that the certificate is imported, you need to bind it to a mapped domain name in your app. Select Bindings > Add SSL Binding. Use the following table to help you configure the binding in the SSL Bindings dialog, then click Add Binding. Hostname The domain name to add SSL binding for. Private Certificate Thumbprint The certificate to bind. SNI SSL - Multiple SNI-based SSL bindings may be added. This option allows multiple SSL certificates to secure multiple domains on the same IP address. Most modern browsers (including Internet Explorer, Chrome, Firefox, and Opera) support SNI (find more comprehensive browser support information at Server Name Indication). IP-based SSL - Only one IP-based SSL binding may be added. This option allows only one SSL certificate to secure a dedicated public IP address. After you configure the binding, follow the steps in Remap A record for IP SSL. Visit your app using HTTPS://<domain_name> instead of HTTP://<domain_name> to verify that the certificate has been configured correctly. If you think your certificate's private key is compromised, you can rekey your certificate. 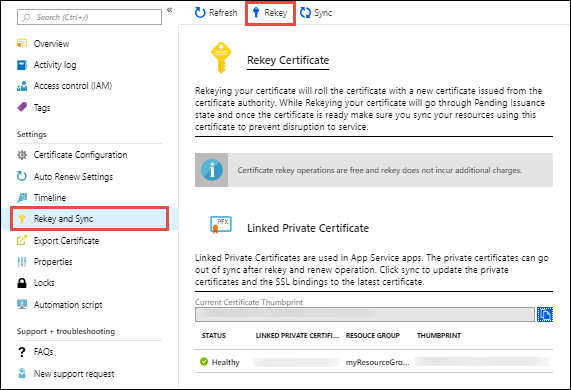 Select the certificate in the App Service Certificates page, then select Rekey and Sync from the left navigation. Click Rekey to start the process. This process can take 1-10 minutes to complete. Rekeying your certificate rolls the certificate with a new certificate issued from the certificate authority. Once the rekey operation is complete, click Sync. The sync operation automatically updates the hostname bindings for the certificate in App Service without causing any downtime to your apps. If you don't click Sync, App Service automatically syncs your certificate within 48 hours. 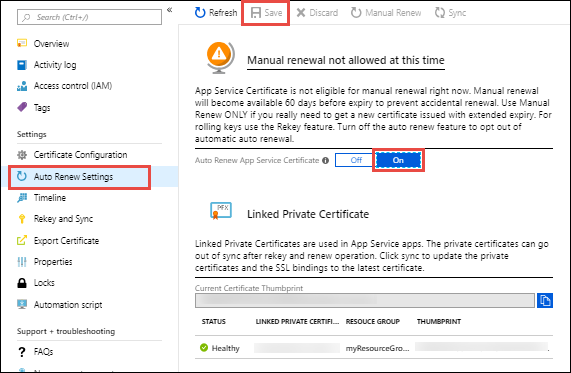 To turn on automatic renewal of your certificate at any time, select the certificate in the App Service Certificates page, then click Auto Renew Settings in the left navigation. Select On and click Save. Certificates can start automatically renewing 60 days before expiration if you have automatic renewal turned on. To manually renew the certificate instead, click Manual Renew. You can request to manually renew your certificate 60 days before expiration. Once the renew operation is complete, click Sync. The sync operation automatically updates the hostname bindings for the certificate in App Service without causing any downtime to your apps. # Create an App Service plan in Basic tier (minimum required by custom domains). # Create a web app. echo "Configure a CNAME record that maps $fqdn to $webappname.azurewebsites.net"
read -p "Press [Enter] key when ready ..."
# hostname "www" and point it your web app's default domain name. # Map your prepared custom domain name to the web app. echo "You can now browse to https://$fqdn"
$fqdn="<Replace with your custom domain name>"
$pfxPath="<Replace with path to your .PFX file>"
$pfxPassword="<Replace with your .PFX password>"
Write-Host "Configure a CNAME record that maps $fqdn to $webappname.azurewebsites.net"
Read-Host "Press [Enter] key when ready ..."
# Add a custom domain name to the web app. # Upload and bind the SSL certificate to the web app.